This recently completed luxury self-build ICF home demonstrates what can be achieved with Durisol ICF. 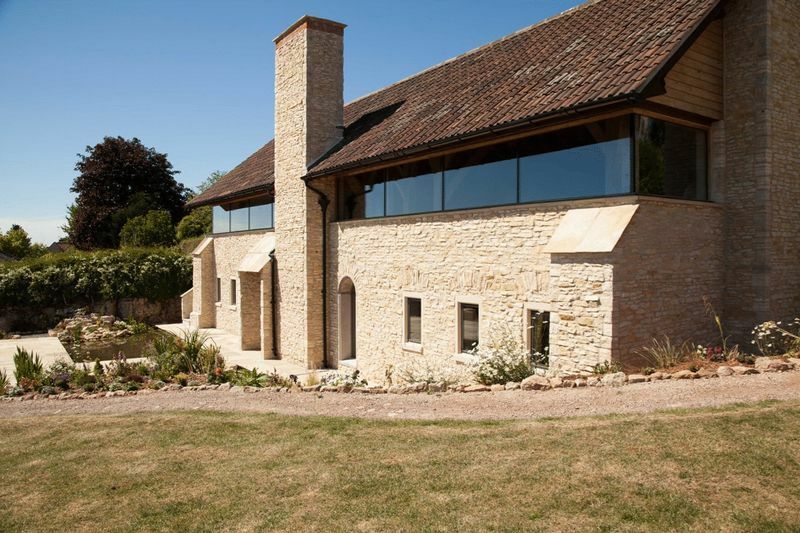 Two self-builders undertook this project to create a six-bedroom, five-bathroom, two elevation upside down home in Somerset. 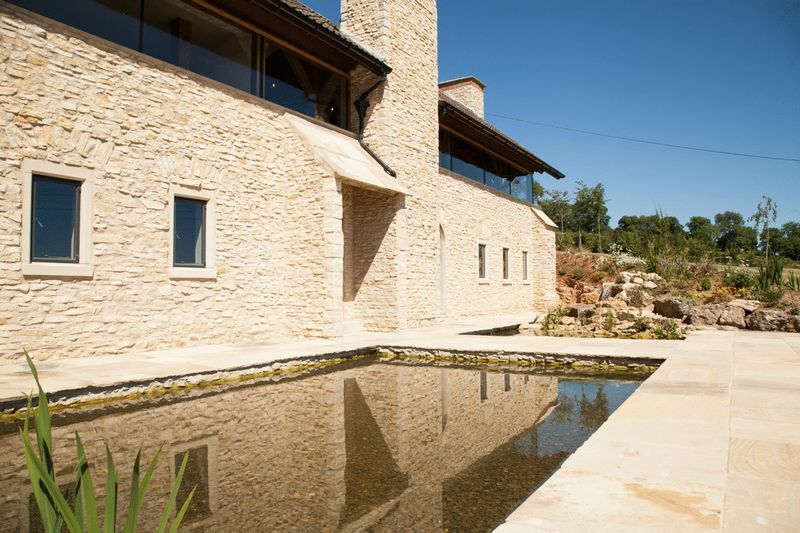 This was an ambitious project for two relatively novice self-builders, yet the simplicity and durability of the Durisol ICF system enabled the pair to build this stunning six-bedroom home successfully. 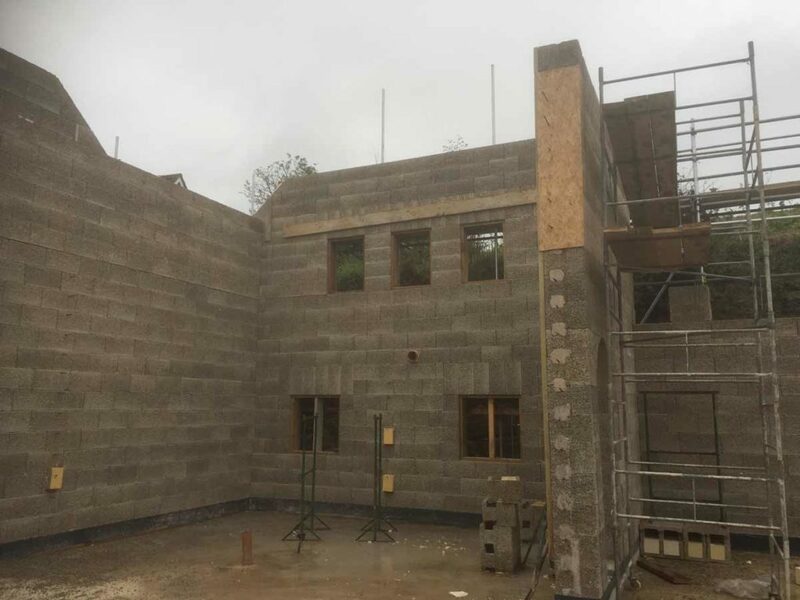 The envelope of the build was constructed with Durisol D365/120s woodcrete insulated concrete formwork to create a 365mm thick solid wall with U-Values of 0.15 before finishes. The formwork was dry stacked (no mortars or glues) to 2.5 metre lifts freestanding and then filled with C30 strength concrete with 10mm aggregate s5 slump – 1m3of concrete fill’s 10m2of Durisol formwork. The two self-builders were able to build the main envelope themselves without requiring external contractors. This factor significantly reduced their build time and saved substantially on costs. 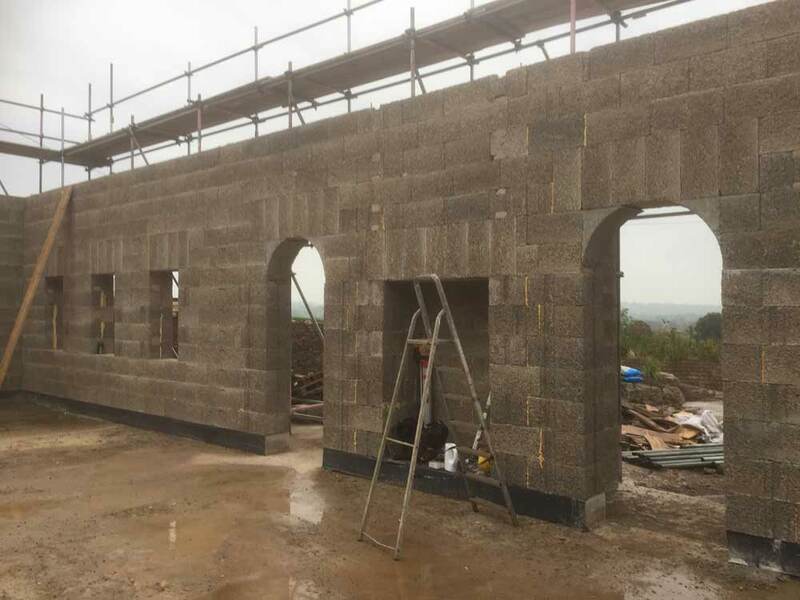 Despite being the only two workers on site, they were able to construct from the damp proof course up to seven courses (1.75m) in just five days. The cost savings on labour allowed money to be reintroduced into the budget and allocated elsewhere to help achieve the high-end finish they desired. The internal ground floor walls were built at the same time as the envelope with Durisol D170/120s formwork. The internal walls link into the envelope to create a super strong monolithic structure. The Durisol formwork walls were faced externally with stone slips, with wet plaster directly applied internally. 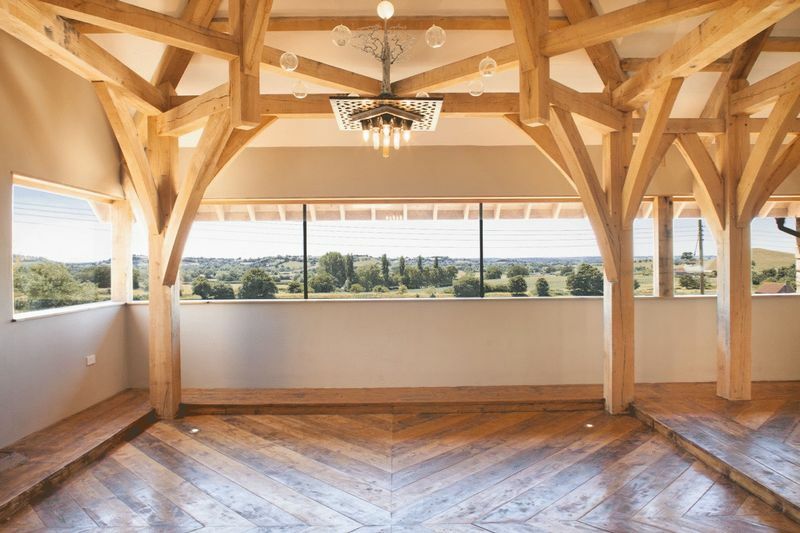 The design of this home, strongly influenced by Saxon architecture with post and cruck oak framing, is exceptional. The centrepiece is the large, first-floor open plan living area. 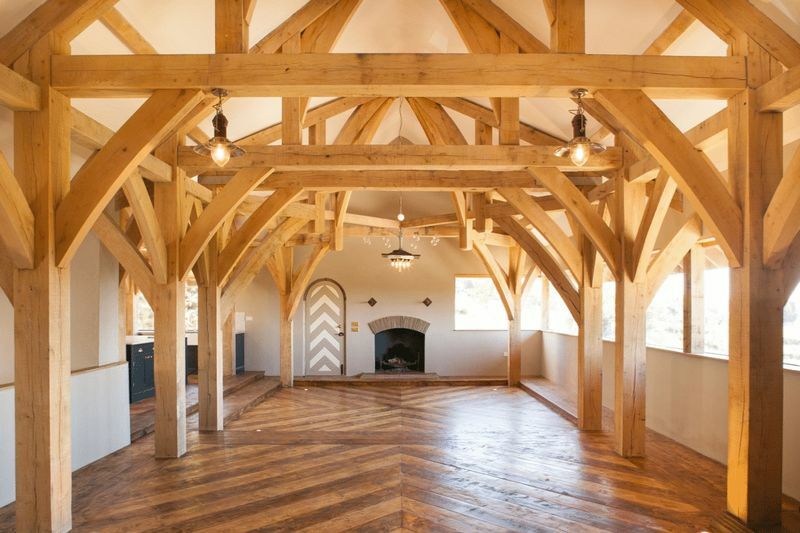 Here the beauty of the oak inner frame is revealed in its full glory. The glass perimeter between the block wall and roof detail allows light to flood in and the countryside views to be genuinely appreciated. The depth of the Durisol walls contributes towards the character and period style of the build, and its strength supports the grand open plan design. The luxury self-build ICF home is now for sale on the open market and as it’s such a stunning property we’re sure it won’t be available for long. If you’re looking for an alternative build method for your self-build home please get in touch. We can show you other successful self-build ICF projects and review your plans with you. We also offer free ICF training which will give you the opportunity to learn about Durisol ICF and have a go at building with it.